189.62 carats Orlov Diamond in Russian Imperial Scepter was originated in India. The fascinating Orlov diamond weighs an enormous 189.62 carats and it measures 47.6 mm in height, 31.75 mm in width, and 34.92 mm in length. Mined in India, its clarity is typical of the finest Indian diamonds and its color possesses a slight bluish-green tint. Its shape resembles that of a half a pigeon's egg and its upper surface is marked by concentrated rows of triangular facets, with corresponding four-sided facets appearing on the lower surface. The total number of facets is roughly 180 with a slight indentation on one of its sides. The Orlov is mounted in the Imperial Sceptre, made during the reign of Catherine the Great (1762-96). As of today the Orlov is one of the most important items in one of the greatest collections of gems and jewelry, the Treasures of the Diamond Fund, Gokran. This incredible stone comes with a disputed history which makes it all the more desirable, including the story of a French soldier stealing the stone from an Indian Temple. According to the account, the Orlov was set as one of the eyes of a Lord Vishnu's idol in a sacred temple in the Srirangam, town in Tiruchirapalli district of Chennai, India. The French soldier, who deserted and found employment in the neighborhood of Srirangem learned about the invaluable stone. Since no Christian was ever admitted beyond the fourth of the seven enclosures, he embraced the Hindu faith and eventually obtained the appointment of guardian to the innermost shrine employment within the walls of the temple. One stormy night, he took out one of the diamond eyes (leaving the second one intact), swam the river and escaped into the surrounding jungle to the comparative safety of the English army encamped at Trichinopoly. Finally, he made his way to Madras (Chennai), where he sold the diamond for £2000 to an English sea captain who brought it to London and sold it to a Jewish merchant for £12,000. At some point Catherine the Great, Empress of Russia, became interested in the diamond, but since it would appear unseemly for a monarch to bargain with a commoner, she dispatched Count Orlov, her lover, in the role of royal go-between with authority to purchase the stone from Safras on her behalf. This explanation seems reasonable and the diamond was named for Count Orlov to thank him for his service to the crown. 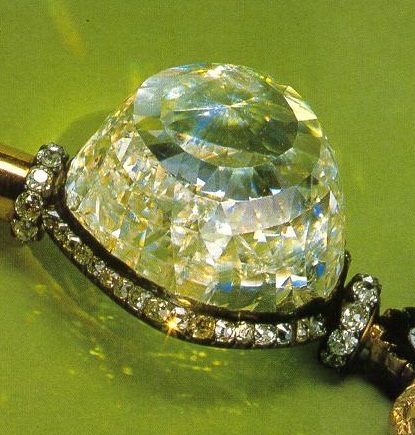 Whatever legend one chooses to believe about the Orlov Diamond there seems to be just a single indisputable fact; the stone still resides, in its original Mughal Cut form, in the Imperial Sceptre of the Court of Russia in the treasures of the Kremlin.